Are you wanting to make a change in your home this new year? Is it time to refresh your space and align it with your personal style and updated taste? Start with your kitchen. The kitchen is a place where you spend a lot of time at home, even if you’re not a huge cook. The kitchen is where we naturally gravitate when we want to relax, and when we are entertaining friends and family. But kitchen renovations are really expensive, right? They don’t have to be! You can use small changes and upgrades to make a big impact and keep your budget intact for the rest of the year. Cement kitchen tiles are one of the ways you can update the overall look and feel of your kitchen, while adding serious value and infusing your personal style. Why Use Cement Tiles in the Kitchen? Cement tiles are not your average ceramic tile. While ceramic tile is fired in a kiln with a painted on design, cement tiles are made with a mixture of cement, sand, powdered marble, pigment, and compressed under two thousand pounds of pressure. The design of patterned cement tiles is embedded into the tile itself! Because of their unique manufacturing process, cement tiles are far more durable and long-lasting than ceramic tiles, and even hardwoods. In terms of the kitchen, cement tiles make a smart choice for a number of reasons. Cement kitchen tiles won’t chip, crack and fade due to everyday wear, and they won’t stain if they are properly sealed during installation. You can also count on them being less slippery than ceramic tiles. 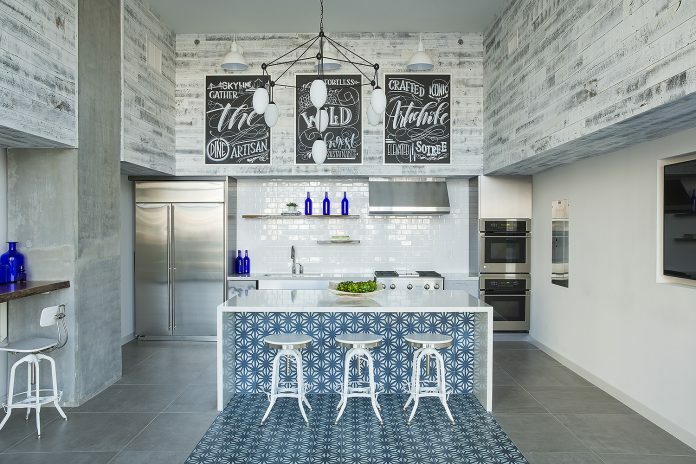 Where Can You Use Kitchen Cement Tiles? Kitchen wall tiles can add a pop of color and pattern you’re looking for to upgrade your kitchen and break up any monotony going on. Use them just beneath the cabinets, or extend them all the way up the walls. 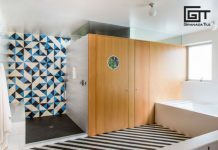 The overall design result depends on the style of the tile used, whether neutral and single toned or patterned cement tiles. Either way, the look is very up-to-date and delivers a wow factor. Find more ideas for using kitchen wall tiles here. Cement kitchen floor tiles are durable enough to hold up to everyday usage, beautifully. Trending designs are large Moorish patterns, patterns with elegant scrolls and soft edges, and geometric patterns that make a bold statement while balancing with the neutral cabinets and countertops. The face of a kitchen island or peninsula is a creative place to incorporate the cement tiles used on the backsplash or floor. You can bridge these two areas, or use an entirely different tile design to add visual interest. Use this space to bring in a pop of color and texture. A feature design in the kitchen could mean a tiled emblem or medallion on a wall, a brightly colored faux “rug,” an accent wall, or an unexpected pattern behind open shelving or glass front cabinets. To create a feature wall, create stripes with tiles, use large geometric patterned cement tiles, or place multiple patterned kitchen wall tiles in a patchwork type pattern on a wall. Another creative idea for a tile feature is to create a rug or runner using two or more different kitchen tiles on the floor. The rest of the floor may be simple and neutral, while the rug can be brighter and bolder in color and design. Black and white combinations are especially on trend right now, and can work for both traditional and modern spaces alike. A contrasting geometric pattern provides a contemporary and eclectic vibe. A black and white, or white and gray Moorish design is elegant and works well in sophisticated kitchens and dining areas. 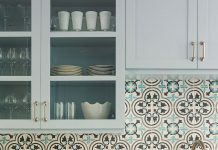 Many homeowners who wish to use cement tiles to spice up their kitchen in the new year, but also want to keep their space easy on the eyes and timeless, often choose soft neutrals in white, cream, and gray to tile their backsplash and floors. Traditional Moorish, Mediterranean and Moroccan, and geometric patterned cement tiles work well as backsplashes, walls, and on floors. When combined with white or light gray cabinets, these patterns don’t look too busy, while adding serious style. Mixing flooring materials is another unique way homeowners have been using cement kitchen tiles in recent months. Hexagon tiles, in particular, have been popular for creating piece-y edges when butted up to hardwoods floors. The unexpected flooring transition is both playful and stylish. We love our neutrals, but don’t be afraid to play with some color as well. Popular cement tile colors are dreamy blues and bright cerulean hues, creamy grays, pastels, black, rustic terracotta shades, and even pink. Many traditional patterned cement tiles incorporate many different colors to offer something that will work with just about any accent color in your home. Colors can be incorporated in many ways, but the best way to keep a kitchen timeless is to use mostly neutral toned cement tiles. Where Can You Order Cement Kitchen Tiles? Granada Tile makes it easy and hassle-free to order top quality, artisan made cement tiles online. Browse through our tile collections to get ideas for designs, look through our examples of in-stock tiles, or contact us directly about creating your own custom cement tile. You can use virtually any color or pattern that you can dream of, and we will have our artisans make it for you by hand, using a custom-made mold. Contact our cement tile experts today to begin designing your dream kitchen for the new year! We will help you stay on budget while increasing the style of your kitchen.